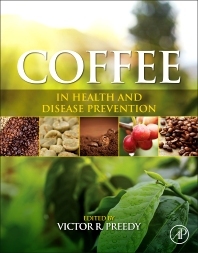 Coffee in Health and Disease Prevention presents a comprehensive look at the compounds in coffee, their reported benefits (or toxicity risks) and also explores them on a health-condition specific level, providing researchers and academics with a single-volume resource to help in identifying potential treatment uses. No other book on the market considers all the varieties of coffee in one volume, or takes the disease-focused approach that will assist in directing further research and studies. The book embraces a holistic approach and effectively investigates coffee and its specific compounds from the biochemical to the nutritional well-being of geographical populations. This book represents essential reading for researchers in nutrition, dietetics, food science, biochemistry, and public health. 56.5. Which Coffee Components Play an Important Role on Increasing Adiponectin Levels? 66.7. Does Coffee Protect Humans against Aflatoxin B1? 85.3. How Does TRG Ameliorates Oxidative Stress in GK Rats? The different chapters cover what is essential for the prevention of coffee diseases. Good approach for the future.